Aukey Direct via Amazon has Aukey Quick Charge 2.0 36W 2-Port Car Charger + 3.3 Ft. Micro USB Cable for $19.99 – $9 w/ promotional code 5INTGRF6 = $10.99. Shipping is free with Prime or if you spend $35 or more. Amazon.com is offering $5 off $75+ or $10 off $100+ Wellness Pet Food Purchases. You will see the savings automatically during checkout. Shipping is free via subscribe & save unless otherwise indicated. The Chase Marriott Rewards Premier Credit Card is a great choice for anyone who frequently travels. This card allows its user to rack up points towards free stays at Marriott hotels in a variety of ways. Plus, if you spend at least $1,000 in your first three months of using your Chase Marriott Rewards Premier Credit Card, then you will get a bonus of 50,000 points. That will get you 6 nights at a category 2 location, or 7 nights at a category 1 location. You also get one free nights stay at the time your account is approved. In addition to the free nights stay on account activation and the 50,000 bonus points, the annual fee is waived for the fist year you have your card for an additional $85 dollar value. You earn points toward nights at a Marriott hotel with every dollar you spend using your Chase Marriott Rewards Premier Credit Card. You get 5 points per dollar spent on a stay at a Marriott location, 2 points for every dollar spent on airfare, car rental, and restaurants, and one point for every dollar spent anywhere else. If you travel enough to warrant an interest in a Chase Marriott Rewards Premier Credit Card, then chances are you end up traveling abroad from time to time. Thankfully this card is equipped with SmartChip technology, so you can use it all around the world, and as an added bonus there are no foreign transaction fees when you use this credit card abroad. It is well known to those who travel abroad regularly that those foreign transaction fees can add up fast, so this is a real bonus for heavy travelers. Next time you travel abroad you will be able to enjoy cashing in your points for a free night’s stay, and you will be able to make your purchases without extra fees. Every year on the anniversary of your account activation you will get a credit for a free nights stay at a category 1-5 hotel. You can also work toward elite status with your Chase Marriott Rewards Premier Credit Card so you can earn even better rewards. Elite status is achieved through a combination of the time you keep your card active and reaching spending milestones. There are different levels of elite membership, and each one has its own set of great benefits. You earn one elite night credit for every $3,000 dollars you spend on your card. That credit is in addition to all the standard points you earn while spending that money on your Chase Marriott Rewards Premier Credit Card too. You also earn a 15 nights credit toward achieving the next level of elite membership every year upon the anniversary of your account activation. If you want to start earning all of these great rewards, then you need to apply for a Chase Marriott Rewards Premier Credit Card today. For the frequent traveler there are few things that can beat free nights at a quality hotel like the Marriott. The Marriott Rewards Premier Credit Card from Chase is ideal for people who travel often and like to stay at the Marriott chain of hotels worldwide. With an annual fee of $85, this card costs $40 more than the standard Marriott Rewards Credit Card, but it is totally worth it if you travel frequently since it gives you a free night stay e-certificate at a hotel in category 1-5 every year. Plus, you get to earn 5 points for every $1 spent at Marriott locations and 2 points for every $1 spent on dining, car rental and airline. See our full list of Credit Card Promotions! The Lufthansa Premier Miles & More World MasterCard® currently offers 20,000 bonus miles after the first purchase. This card also offers a 15 months 0% APR introductory rate on balance transfers. It’s a great choice for frequent travelers with chances to earn up to 15,000 additional miles when cardholders complete an initial balance transfer. The card also allows you to earn earn 2 miles for every dollar spent on ticket purchases directly from Miles More integrated airline partners. Then you can earn 1 mile for every dollar you spend on other purchases. This great card only comes with a low annual fee of $79 per year. This opportunity is ideal for those that fly with Lufthansa. It can be a daunting task trying to decide on a credit card, and it’s important to consider the different features and rates on cards before making any final decisions. With so many cards and features to consider, it can be challenging, but the Lufthansa Premier Miles & More MasterCard® is one of the most talked about cards lately. It’s important, whether you’ve been considering getting this card for some time, or you just started having an interest in it now, to learn more about it and see all it has to offer before making any final decisions. There are a few features offered with this card that are particularly worth taking note of. Whether you’re already a client or not, you may be interested in this card. It comes with more protection than most other cards, so you know you’re safe. The Premier Miles & More MasterCard comes with an impressive 20,000 bonus award miles, which you receive automatically, upon signup. You also have the ability of earning up to 15,000 extra points on top of that, simply by completing an initial balance transfer. One of the best features of this card is that you can earn 2 award miles for every dollar spent on ticket purchases. This is a feature you don’t see on most other credit cards, so you get more bang for your buck. With a low, $75 annual fee and a low intro APR on balance transfers, it’s one of the least expensive and most rewarding cards available today. The Premier Miles & MasterCard also has the annual fee waived for Senator and HON Circle Members, so if you’re eligible, you can take advantage of this bonus feature. Cardholders receive a companion ticket annually. 0% Intro APR on balance transfers for the first 15 months after account opening, after that a variable APR currently 15.99% or 24.99% depending upon your creditworthiness. You can always feel safe and secure when you have a card like this in your wallet. Once you learn more about the features offered, it becomes easy to see why it’s such a popular choice. You can even get coverage on the card, coverage that includes ambulance expenses, operations, x-rays, trip cancellation insurance, trip delay insurance and baggage delay or loss insurance. There is also optional additional insurance you can purchase if you’re interested. You can inquire more about this and get the help and information you need when you get signed up. The process doesn’t take long and in a matter of days you can have your new card and start using it. If you’re interested in getting signed up and getting one of these cards for yourself, the application process is easy. You can even complete the entire process online, from your computer. This saves you a ton of stress and hassle, and if there are ever any questions you need answered, you can go through their reliable customer support team at any time. There may be plenty of different cards to choose from, but the Lufthansa Premier Miles & More World MasterCard® stands out from the rest with its bonus offer of 20,000 award miles awarded upon first purchase and 15,000 additional award miles when you complete an initial balance transfer. When you compare it to its competitors, it becomes easy to see why it is such a popular choice. 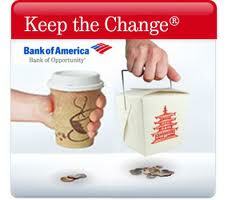 Did you know you can make $250 from Bank of America’s Keep the Change program? This is a Bank of America program that will match up to $250 of the change from your debit transactions for the first 3 months. Lets say you buy a sandwich for $2.25; instead, it will show up as a $3 charge, and the 75 cents goes into your savings account. KTC will also put in another 75 cents to match your savings. Basically, you want to have charges of $1.01, $2.01, $3.01, etc to maximize this deal. The Keep the Change Program from Bank of America is an easy and convenient way to get a little extra money in your savings account. Although you are probably not going to get rich this way, the program has the advantage of being free and simple to use. It also requires the minimum amount of effort on your part, as once you are signed up, the money is deposited in your savings account automatically; you don’t need to do anything to make it happen. The program rounds up any purchases that you make with your Bank of America debit card, and then deposits that difference in your savings account. Supposing you buy lunch and it costs $7.25; you are actually charged $8 and your checking account is debited $7.25 as normal, and the remaining 75 cents is deposited in your savings account. Obviously, the more you use your card, the more money you can accumulate in your savings account, and the bank will match your rounded up amount for the first three months after you enrol in the program. In other words, if you pay $76.42 for groceries with your card, you get 58 cents of your own deposited in savings, and an extra 58 cents from the bank. For simplicity sake, deposit $500 in your account. In order to do keep the change, you must sign up for a savings account (this can be done when opening a checking). **You must set up $25 auto transfer each month from Checking to Savings for Savings account to be free. Once you have your checking, savings, and debit card, visit this Keep the Change link to enroll. You will have a 3-month window to get the $250 match. Here are a the quickest ways to maximize this offer. 1) Go late at night and pump gas at $1.01 each time. Do this every time you need to fill up your gas tank, so give and take about 253x at $1.01 each time. 2) You could also pay your phone bill, water bill, or electricity bill at $1.01 each time online. Check with your utility company to see the policy on this. There are some restrictions that come with the Keep the Change program. Bank of America will only match up to a maximum of $250, and the matching amount isn’t deposited immediately; rather, you have to wait a year and keep your account open during that time until you get that extra money. Still, you can make $250 from Bank of America if you use the card often enough. If you have a small business account, it is not eligible for the program; only personal accounts are. The US Airways Premier World MasterCard® offers 40,000 mile bonus to cardholders after they make their first purchase. You’ll earn an additional 10,000 bonus miles when you transfer a balance within 90 days of account opening. There is a 0% Intro APR on balance transfers for the first 15 months after account opening. Some other bonus features that you can enjoy with this card include first class airport check-in line privileges and priority Zone 2 boarding. The reward program provides you with one mile per dollar spent and 2 miles per dollar spent on US Airways purchases. Choosing the US Airways Dividend Miles MasterCard would be a great idea for any person that does a large amount of traveling on a regular basis. Opening this card would allow you to enjoy up to 50,000 bonus miles. This card would provide you with 2 companion tickets every year, this could help you to plan amazing vacations that your loved ones will remember and cherish. Since you would be getting these tickets for free, you would have more spending money available to take advantage of some of the amazing activities available to you when you finally reach your destination. You would enjoy 1 mile for every dollar that you spend using this card, it is possible to earn free travel through simply spending money on the things that you need in order to enjoy life on a daily basis. When you make this part of your spending routine, you will start to see the miles add up in your account in no time at all. Also, you would enjoy 2 miles for every dollar that you spend on US Airways purchases, this is a great way to make the most of the way that you already travel. If you are someone that travels on US Airways on a regular basis, you are currently missing out on tons of bonus miles without this card. Having this card in your wallet would ensure that you are able to enjoy rewards every time that you spend money on any purchase with this airline. Also, you would enjoy zone 2 priority boarding on every flight that you take, which means you spend less time waiting around for your flight and building up stress. Additionally, you would be able to redeem your points for flights starting at just 20,000 miles. When you are interested in getting reward travels, it is very likely that you would find many other airlines to be very restrictive in what is available to you. However, you would have a greater variety of options while also using fewer points when you go with this card. The US Airways Premier World MasterCard® is a great choice for anyone looking to get free US Airways flights. The card lets you earn free flights with one simple purchase (free US Airways flights start at only 20,000 points). Apply online today for this offer and use your card for the first time for an easy 40,000 bonus points. Furthermore, the card is great for those of you who need to carry over balances because of its 0% intro APR on balance transfers for 15 months. Sign up today and take advantage of all these great features! The Barclaycard® Ring Mastercard® is designed to be as simple as possible, with a low 8% variable APR and no balance transfer fee. This is a great card because of the simple features and lack of fess. For example, many cards charge a 3% foreign transaction fee, but the Barclaycard Ring credit card charges only 1%. Additionally, the maximum late fee for the Ring card is $25 instead of a $35 late fee that many other cards charge. This card also has an innovative rewards program called Giveback. When account holders opt in for paperless statements and pay their bills on time, the community benefits and the card will kick back more of a reward to account holders, which you can use as a statement credit or to fund charitable projects. The Barclaycard Ring has programs in place for you to point your card profits where you need them to go. The card also has no annual interest rate so that you can keep your hard earned cash. Barclaycard Ring also has a low 8% variable APR for you to save your dollars and for you to profit from your work. Barclaycard Ring gives you the power to take charge of your earnings. With the Barclaycard Giveback program, you can reap in card profits. You can keep Giveback rewards for yourself or bestow your generosity on charitable organizations of your choice. Barclaycard Ring gives you the tools you need to track your card profit. Be an active member and benefit. Whether you want a feature of Barclaycard Ring or want to eliminate a restriction against you, just vote! That is right, Barclaycard ring wants its members to voice their concerns for their needs. Think of you and your fellow Barclaycard Ring members taking your financial futures into your own hands. You can be part of that group. Barclaycard Ring wants you to know how you can voice your needs and that is why Barclaycard Ring has easy to understand terms. Unlike other cards, you do not need to pick through heaps of text to understand your benefits, but with Barclaycard Ring only read the easy to understand terms and benefit. The new GivebackTM2 program Share the estimated profits based on the community’s financial performance. Barclaycard Ring has no annual interest rate. This zero rate means you can keep your money. Another perk of being a Barclaycard Ring member is that there is no penalty for over-the-credit-line payments. You do not need to worry about current card balance when you pick-up a morning coffee on the way to work. You do not need to worry about high APRs either. Barclaycard Ring has a low APR. Competing cards may have APRs fixed at 20% or more, but Barclaycard Ring has only an 8% variable APR. The APR for Barclaycard Ring is calculated from a Prime Rate formula that stays up to date. With a low 8% APR, the Barclaycard® Ring MasterCard® is ideal for anyone who occasionally uses a credit card to purchase large items and pay them off over a few months. If you did the same with a rewards cards (which currently have average APRs around 16%), you would pay double the finance charges as you would on the Ring card. Furthermore, the card is great for use during vacation and travel because of its low 1% foreign transaction fee. Sign up today and take advantage of all these great features! 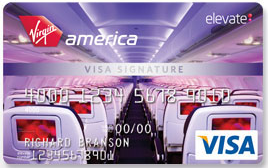 The Virgin America Visa® Signature Card is offering up to 25,000 Elevate bonus points (worth up to three free flights) plus $150 off a companion ticket every year. To earn these bonus points, simply make a single purchase with the card, and you’ll receive 10,000 bonus points. Then you can earn 5,000 bonus points when you do a balance transfer of $5,000 or more within the first 90 days. You’ll receive an additional 10,000 bonus points when you spend $25,000 on everyday purchases within a year. On average, the 25,000 bonus points would be worth $400 in Virgin America airfare. One of the greatest benefits of this specific card is that with it, you are able to earn points at a faster rate. Considering how often you’re likely to use the card, you can only imagine how quickly the points will add up in a short amount of time. Reward points is not often one of the main reasons someone signs up for a credit card, but it is a nice bonus feature to have. Once you reach a certain level of points, you can use them for whatever you want, such as a discount off plane tickets or other items. Whether you already have a Virgin America card or this is your first, the Virgin America Visa Card certainly has a lot to offer. With this card, you get more points than with the average card. You get 3 points for every $1 spent on Virgin America, so each time you take a flight somewhere, you’re earning points that you can use later on. If you travel frequently for business or personal purposes, this is a fantastic card to have because you know it’s going to come in handy. With a low intro rate, you don’t have to worry about spending a fortune just to get signed up. The low $49 annual fee means you can spend money on your card without having a huge bill at the end of each month. Applying for the card is easy and you can even complete the application entirely online. If you need help, they have a great customer service team who is willing and able to help you out when you need it. You simply need to provide some basic information to get started and apply today. You can get signed up today, receive your card in just a few days and start enjoying the perks the card has to offer. If you’re a frequent flyer, you know you’re going to take advantage of the rewards this card has to offer. It makes flying easy and convenient, plus you get bonus points to save on future flights. Once you take all these great features into consideration, it’s not hard to see why the card has such high popularity. It’s a great option, whether you’re looking for a starter card or simply want to add another credit card to the ones you already have. The Priceline Rewards Visa® Card is offering 5,000 bonus points ($50 value) after cardholders make their first purchase! 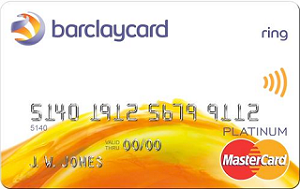 The card is also featuring a 15 month 0% APR on balance transfers as well as no annual fee! Additionally, you will get 2x the points on all purchases! 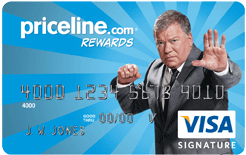 The Priceline Rewards Visa is a great points-based card with no annual fee. This card is ideal if you use Priceline.com because you’ll earn 5 points per dollar spent on Priceline purchases. As many people know Priceline has ‘Name Your Own Price’ and a person can earn five times the points on ‘Name Your Own Price’ purchases, as long as the purchases are eligible. If a person spends a $100 on an eligible purchase, then they will receive 500 points. The five times bonus feature is very good and many people rave about this particular bonus. Cardholders will also earn two times the points on everything else. The good thing about this is that a cardholder can earn unlimited amount of points. Cardholders will earn two points for every dollar that they spend. For example, if they spend nine dollars, then they will receive 18 points. This bonus is a big hit with consumers because they can purchase virtually anything and earn points while doing so. Redeeming points is very easy to do. All a cardholder needs to do is redeem their points for statement credits for purchases on their account that is $25 or more. Once a person has redeemed their points they can reward themselves by getting airline tickets. If the cardholder does not want to put their points towards a plane ticket, they they can use it for a rental car. Many cardholders choose to get a hotel room with the points that they have earned, while other people choose to get gift cards. These are just a few of the things a cardholder can get when they redeem their points. There is a great introductory APR, which is 0%. This means that new card members will pay 0% APR on balance transfers. This introductory APR is good for the first 15 billing cycles. Once the 15 month period is done with, a person’s APR will be either 14.99% or 21.99%. The person’s APR will depend on how good their credit is. The Priceline Rewards Visa® Card is worth getting, especially if a person uses Priceline quite a bit. All a person needs to do is make eligible ‘Name Your Own Price’ purchases and then they will earn a whole lot of points. When a cardholder purchases ‘Name Your Own Price’ products, then they will find it much easier to rack up a lot of points. A person will even find earning two times the points is easy to do. All a person needs to do is use their credit card for things that they would normally get, and then they will receive two times the points. Before a person knows it, they will have a bunch of points that they can redeem, and then get a lot of cool stuff. The Chase United MileagePlus Explorer Card offers 30,000 bonus miles after you spend $1,000 in the first 3 months. The Chase United MileagePlus Explorer card also comes with bag check fees waivers for all cardmembers + one guest as well as priority boarding that allows cardmembers and companions to board flights immediately after first-class and elite travelers. Another perk with the card includes free access to the United Club – a $100 value. The Chase United MileagePlus Explorer Card is particularly useful for frequent flyers who use United for their travel requirements. As soon as you opt for the card, you are offered priority boarding privileges. That means you can avoid the crush of flyers at the boarding gate and get on the plane quickly and prior to general boarding. If you spend $1000 on your card in the first three months of purchase, you are automatically credited with 30,000 bonus miles. You can also get your first bag checked in for free and save more than $100 on their round trip bookings. If you use the Chase United MileagePlus Explorer Card to buy your United ticket online or at a counter, you will be credited with two MileagePlus miles for every dollar spent on your United ticket. This is also applicable on any on-board purchases that you make and you will be credited with 1 mile for every dollar you spend on board. Once a year, card holders are provided with Two one-time use passes to the United Club. These passes allow the users a range of amenities like free beverages, snacks, private meeting rooms, flight upgrades, free Wi-Fi etc. All the miles that you are collect are stored indefinitely on your card. That means you can redeem them whenever you want. There is no limit date or amount to the number of miles you collect. The collected miles can also be redeeemed on seats on any United flight. There are no block out dates, no flight restrictions or location restrictions that are applicable while redeeming points. If you wish, you can also use the miles to enjoy room bookings, complimentary drinks and breakfast, early check-ins and check-outs and other perks at more than 700 partner hotels and resorts worldwide. If you are a frequent flier, the Chase United MileagePlus Explorer will be an extremely beneficial addition to your wallet. Keep in mind that there is no annual fee for the first year and $95 thereafter, so you can try it out for a year and then cancel at no cost as long as you do it before the one year anniversary. You also want to keep in mind the opportunities to earn bonus miles. You can add a second cardholder, at no cost, to get 5,000 bonus miles. If you want to look at it in a long term way, you can get another 10,000 bonus miles every year if $25,000 is spent on the card.